Spargelanbau is the German expression for "asparagus cultivation." Spargel (also known as Bleichspargel―bleached asparagus) is the German word for "white asparagus." Green asparagus is called Grünspargel or grüner Spargel and is harder to find in Germany. Asparágus officinalis L. is the edible shoot of the cultivated plant in the taxonomic family Asparagaceae with over 300 species. It is closely related to the Lily (Liliaceae) family. Asparagus shoots arise from underground rhizomes (a type of stem) early in the spring. Because the plant is a perennial, asparagus is one of the first fresh vegetables on the market. Both green and white asparagus are the same species, but crop breeding over the last couple thousand years has produced "varieties" and hybrids which have different growth characteristics. That is why you cannot turn white asparagus successfully into green asparagus by letting it grow out of the dirt. Asparagus evolved in dry climates and likes sandy, well-drained soils. Knowing that it is amazing that the shoots consist of up to 95% water! Asparagus is very low in calories, with many vitamins and minerals, but green asparagus has more nutrients than white. The first asparagus harvest of the year in Germany, known as Spargelzeit, creates a frenzy of festivals, contests, and general madness. Plan a trip to Germany in April to experience this firsthand. Backlim, Boonlim, Ravel, and Braunschweig have been bred for thick shoots, closed heads and a mild, non-bitter taste. White asparagus is harvested in Germany between April and June 24 of each year. The farmer hills up sand and compost over the rootstocks to blanch the shoots as they grow. Asparagus shoots can grow 2 to 3 inches per day in warm weather. Reading, Giant, Palmetto, or Martha Washington have been bred with a lower anthocyanin (the purple pigment) content, which reduces bitterness. They are not as thick or as woody as white varieties and do not have to be peeled. 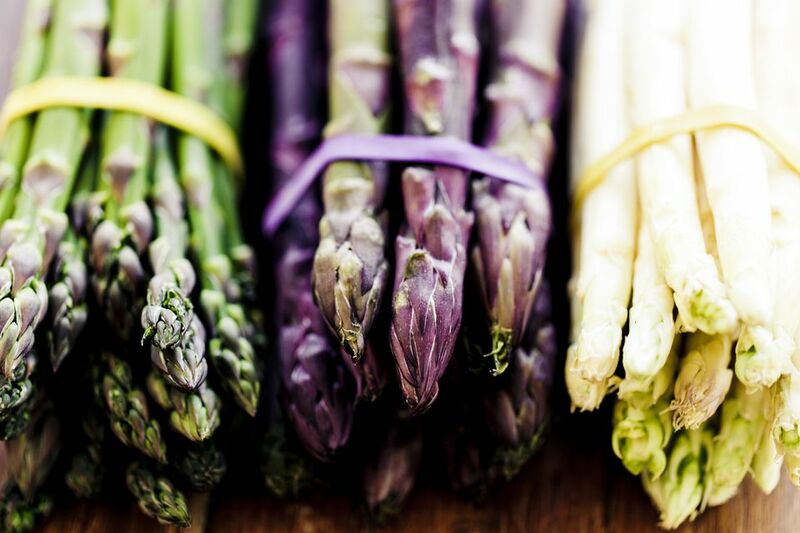 Loved in some countries such as France, violet asparagus is considered inferior to white asparagus in Germany. The color develops when the white asparagus breaks through the dirt crust and light shine on it. Violetto d'Albenga and Purple Passion, bred for a nutty flavor, have up to 20% more sugar and less fiber than green asparagus. It is a new variety and not seen often in stores. Growing white asparagus is an intensive process that takes at least three years until the first harvest. Rootstocks (they are rhizomes, but commonly called roots) are set out in early winter and the plants allowed to grow and flower for two years. In the third year, the farmer mounds sand and compost over the rootstocks and hopes for a warm spring. During harvest, workers go out every morning before sunup and pick asparagus by digging a small hole, sticking a sharp knife into the dirt, aiming for the base of the shoot, carefully pulling out the shoot and filling in the hole with sand using a trowel. Mechanization has not worked because a broken asparagus shoot has very little value. Extra: Minimum diameter of 12 mm (15/32 inch), no hollow cores, perfectly straight and all white. Most expensive. Handelsklasse I (HK I): Minimum diameter of 10 mm (3/8 inch), light bending, light coloration (violet). Good value. Handelsklasse II (HK II): Minimum diameter of 8 mm (5/16 inch), curved stalks allowed, slightly opened flower heads, more color than HK I and sometimes woody. Good for soup stock and students. No matter which quality you choose, the asparagus should be fresh or you are throwing your money away. When selecting fresh asparagus, look for moist cut surfaces, stalks that can be dented with a fingernail and smell sweet, not sour. Do not touch the asparagus at the German market, however, unless you want to be yelled at by the seller. Ask for a sample and find a seller you can trust by asking friends and relatives.